Spring is here! For the past three days, all we've had is rain. It's great, since we've been in a drought for so long, but I wanna go out and play in the dirt! This is putting a bit of a cramp in my style, and I've had a few babies damp off. 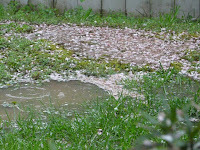 My cherry tree is in bloom, and the pink 'snow' is piled up next to puddles. The petals look so lovely blowing across the yard. 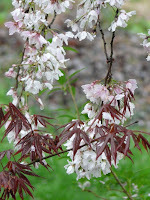 And a picture of the cherry cuddled with one of my Japanese maples. I wish the forsythia would have held onto its blooms longer this year. That would have made a lovely combination. Well I am bummed for you. Its been several days of rain here as well. My tulips have finally opened and its just not the same surrounded by mush. I have hardened off some of the flowering tobacco I got from you and put them out. So far they've loved all the rain and have settled in their pots well. The flowering tobacco LOVES rain. Those bright green leaves look so nice on gray days, too. Sorry you're getting the rain, too! Those tulips are gorgeous -- I wish I could keep them alive here!